^ Syrian State Bureau of Statistics. نتائج تعداد السكان والمساكن لعام 2004 على مستوى الحي. [2016-12-04]. （原始内容存档于2016-03-05）. ^ Syria conflict: Rebels leave Homs under truce. BBC News. 2015-12-09. ^ Rebels start evacuating last stronghold in Syria's Homs. Xinhua. 2016-09-22. ^ Homs Weather forecast. Zoover. 2009 [17 February 2009]. eHoms - Official website for Hims. 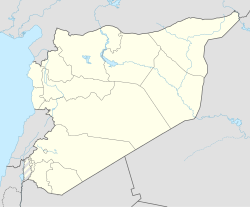 Homs Online - Brief information about the city of Hims.